With four major political parties going into the last two days of their unprecedented battle for the control of 341 local councils, Parliament would today hold a special session to debate a vital issue. The much awaited debate will be on the lengthy bombshell reports of the Commission which investigated alleged Bond scams at the Central Bank from February 2015 to March 2016 and the Commission which inquired into allegations of serious acts of fraud or corruption. These events took place after the Criminal Investigations Department (CID), in a dramatic move on Independence Day, raided the residences of the Perpetual Treasuries Limited owner Arjun Aloysius and its Chief Executive Officer Kasun Palisena. The two multi-millionaire businessmen are among the main suspects in the Bond scams in which they are alleged to have unethically obtained inside information to make a staggering profit of more than Rs. 11.1 billion. The two suspects were questioned for several hours at CID headquarters, later arrested and on Sunday night they were produced at the residence of Colombo Fort Magistrate Lanka Jayaratne who remanded them till last morning. Yesterday morning Mr. Aloysius and Mr. Palisena were produced in Courts and the same Magistrate remanded them till February 16. That means more than 10 days in jail for those who lived in the lap of luxury. Magistrate Lanka Jayaratne also ordered that the Central Bank’s former Governor Arjuna Mahendran, father-in-law of Mr. Aloysius, to return to Sri Lanka before February 15 and make a statement to the CID. The Commission has said that the former Central Bank Governor had allegedly given inside information to his son-in-law so that the PTL could make a huge profit at the bond auction. Mr. Mahendran is now in Singapore, where he is a citizen besides being a citizen of Sri Lanka. Reports indicate that if he does not make a statement or return for the court inquiry, a warrant may be issued for his arrest. In this election week and on the eve of the debate another important event took place. That was the arrest in Dubai of Udayanga Weeratunga, Sri Lanka’s former Ambassador in Russia. He had been evading arrest after being accused of involvement in corruption in the multi-million dollar deal for the purchase of MiG aircraft for the Sri Lanka Air Force in 2005. These three arrests are seen as major steps in the battle against corruption, the battle being lead by President Maithripala Sirisena who is pledging at every election rally that he is determined to clean up Sri Lankan politics and ensure that effective legal action is taken against those allegedly involved in serious fraud or corruptions. The President has also pledged to introduce laws to recover the billions plundered from public money. Prime Minister and United National Party leader Ranil Wickremesinghe also is pledging full support for the President’s battle against corruption though some Sri Lanka Freedom Party (SLFP) seniors and other opposition leaders are calling on Mr. Wickremesinghe to resign because it was he who recommended the appointment of Mr. Mahendran as Governor of the Central Bank. 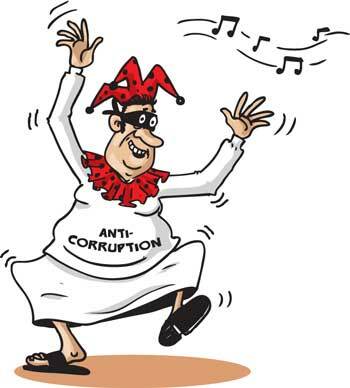 But Mr. Wickremesinghe and other UNP leaders are denying that the party as such had any connection with the bond scam though some related charges have been made against for the former Finance Minister Ravi Karunanayake. Meanwhile the Janatha Vimukthi Peramuna (JVP) also fighting hard for control of a substantial number of local councils, is accusing the UNP, the SLFP and former President Rajapaksa’s Sri Lanka Podujana Peramuna (SLPP) of staging a drama on the corruption issue, a sort of drama that even Bollywood would find hard to produce. JVP leaders say there are deals within deals and wheels within wheels on the corruption issue with some leaders of the other three parties having backdoor deals with each other though it is not clear as to who is trying to protect whom and from what. Amid such high drama, more than 15 million people are registered to vote at the February 10 local council elections and we hope they will be wise and prudent in exercising their ‘right’ in choosing their representatives, mindful of the fact that the prevailing culture of bribery, corruption and abuse of privileges instigated by those in power is sadly, but surely a reflection of people’s own actions and choices.